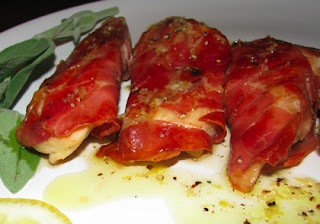 This is a different version, let’s say a lighter version of the Italian saltimbocca, since there is no cheese in it, those are grilled instead of pan cooked and the prosciutto is outside instead of inside the chicken. Those are delicious as a light dinner with a salad, or can also be also served with any vegetable side dish. I served those with leeks and wild mushroom gratin, and it was a good combination. The sweetness of the gratin was very well-balanced with the citrus olive oil dressing I put on top of those chicken strips. Cut the chicken breast in 6 identical strips. Add a little salt and pepper but not too much since the prosciutto gets saltier when cooked. Place one sage leave with two slices of garlic on top of each strip. Wrap the prosciutto around the strips. Use an inside grill and grill evenly on both sides, until the prosciutto turns into a deep rosy color. If you don’t have an inside grill, you may use a broiler. For the dressing, add all the ingredients together in a bowl, mix well. When the chicken is well grilled, add one or more tbs of dressing on top of each strip. Serve hot. This is such a simple recipe yet it sounds so delicious. mmmmhh, you had me sold on that prosciutto di parma. Sounds scrumptious Silvia! Ho provato a chiedere, e non so se sia la ricotta, nel tuo caso, perchè io non ce l'ho utilizzata...o forse le troppe mandorle...che mantengono l'umido...?_? Intanto continuo i test della yogurtiera perché devo provare a rifare quello provenzalissimo che hai postato...:) yum yum!